Education: Tishreen University School of Medicine, Medical College of Pennsylvania-Hahnemann University. Residency: Northwestern University. Chicago, IL. Board Certification: American Board of Anesthesiology (A.B.A.). Area of Specialization: Thoracic, Neuro, Regional, ambulatory, and Bariatric Anesthesia. 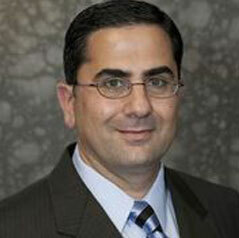 Dr. Hamwi joined Town Square Anesthesia LLC right after graduating from residency. He is a member of the American Society of Anesthesiologists and the American Board of Anesthesiology. Before becoming an anesthesiologist, Dr. Hamwi took part in partial training in general surgery. His areas of interest include thoracic anesthesia with one lung ventilation, Neuroanesthesia especially for aneurysm clipping, difficult airway management, outpatient and obstetric anesthesia. Safety is his number one priority when it comes to anesthesia; which is provided by knowledge, skills, and vigilance.